There are more than 100 types of paints available for forged products including bronze restoration. Furtheremore, there are unlimited number of colors if they are combined with something such as copper powder, silver powder, brass powder, etc. mixed in solvent. Paints themselves are not special but they can be purchased anywhere. However, color combination depends on experience and judgement of each craftsman. Furthermore, we can get quite a different finish by overglazing, for example, coating brown on bronze color. In overglazing, we need to know the result beforehand and have to experience hundreds of times to train imaging power. There are many broken statues with a hole made and hands or neck come off. They can be restored to its original figure. Holes may be puttied up, hand and neck can be connected to each place by welding. A bent objet was also repaired. After thoroughly getting its original state, painting is applied on to cover completely so that repaired portion is not visible. Not only painting teqniue but also experience in forging for sheet metal works has made me achieve this job. 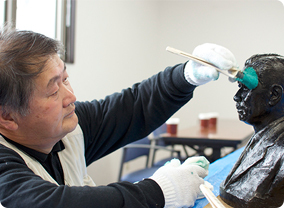 Cleaning with wet cloths is made first to remove stains on the surface of the statues. Damaged statues are puttied or welded for jointing at this stage. After such primary processes, painting is made. Since painting is most critical process, utmost care is taken in working. Basically black-based primary painting is made and then overglazed to get original color finally. Thick overglazing may deteriorate attraction or character as a bronze statue. To avoid thick overglazing, 80 - 90% of paint material is removed from the paint brush and only the paint soaked into the brush is used. Removing unneccesary paint material is important. This shouldn't be waste. Brush itself is consumed in the quantity of a few pieces per statue. Necessary materials are used freely. Image of finished figure is also important. Based on the image formed in the head, painting material is compounded and the most optimum material is selected. Unlike other ordinary painting which runs in the way as drawing a straight line evenly, this painting is made thinly in the way as polishing shoes so that the material adapts itself nicely to the figure. The surface of bronze statues is not even. Painting should be made over on over so that the material adapts itself to the figure. Knack is to move the brush in circle just like polishing elaborately. At first I stroked a brush linearly but through experience I got to the way I use now.